Scroll down & click on the title or image for more info & online ordering. 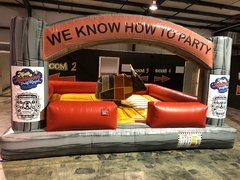 Elevate your next party or celebration to the next level with an awesome party rental like the Mechanical Bull from North Mississippi Party Rentals! An absolute riot for guests of all ages, the Mechanical Bull bucks and spins around wildly around as it tries to flip guests off its back and onto the cushioned mat! We provide you with a professional attendant to operate the station, and every order comes with free delivery and setup! Impress and challenge your guests with an exhilarating ride on our fierce Mechanical Bull! To ensure availability, be sure to make your reservation ahead of time, and feel free to reach out to us directly if you have any additional questions or concerns!